Conservative commentator Pat Buchanan casting Newt Gingrich as a "political opportunist" who is using the so-called "Ground Zero mosque" issue to position himself for a run at the Republican presidential nomination in 2012. Gingrich on Monday accused President Obama of "pandering to radical Islam" by expressing support for building an Islamic cultural center which includes a mosque two blocks from the site of the Sept. 11 attacks, adding: "Nazis don't have the right to put up a sign next to the Holocaust Museum in Washington. We would never accept the Japanese putting up a sight next to Pearl Harbor. There's no reason for us to accept a mosque next to the World Trade Center." Buchanan, himself a former presidential hopeful, said on MSNBC that Gingrich is "trying to get out and be more flamboyant and more charismatic if you will, and more controversial than Sarah Palin, who is his primary challenger if he gets into Iowa and New Hampshire." Continued Buchanan, who himself has made controversial comments in the past: "How do you get more attention than Sarah Palin, who's very good at this, is to go two steps further. I mean, I think bringing the Nazis into the argument is always absurd in American politics because there is no valid comparison there. And secondly, you know, you bring that in and that's all we start talking about." 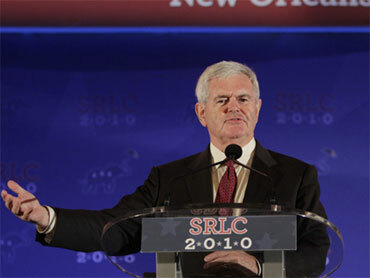 "So I think Newt went too far with that comment - but I know why he's doing it," he added. Gingrich has openly flirted with a presidential run and has used the mosque issue in his fundraising materials on behalf of the group Renewing American Leadership Action, telling supporters over email (as Salon reports): "Please SELECT HERE to STOP the Ground Zero mosque! Your decisive DONATION to Real Action will help us to RALLY and ACTIVATE all Americans, to TAKE REAL ACTION!"